Two thoughts, apparently completely unrelated. 1. Russell Roberts writes economics textbooks wrapped up in very good fiction. His books are widely available on Amazon, and possibly your local library. That said, I've only read the first, "Invisible Heart". He also blogs at a personal favorite, CafeHayek, with Donald Boudreaux, and also hosts a podcast called EconTalk, if you into those things. "Don't expect pigs to fly, cats to bark or politicians to act as if they care about us. They care about us if it helps them prosper. If it doesn't, they care about more important influences." The post is about libertarian paternalism and its failings. 2. Hilly Kristal has passed away. Founder of the CBGB club in New York's Bowery, Hilly introduced a lot of people to a lot of good music: Television, The Ramones, Talking Heads, Patti Smith, and Blondie are a few that got a real start here. 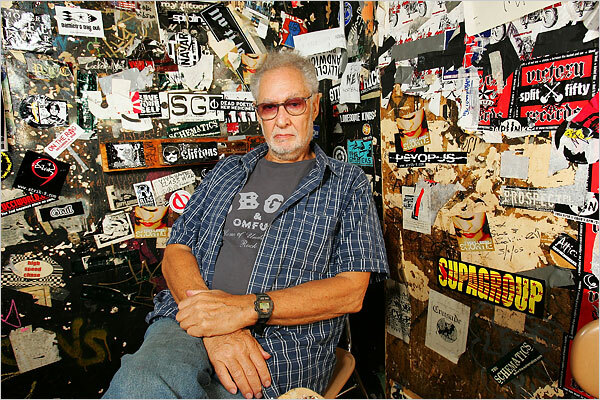 After getting his start at the famous jazz club Village Vanguard, Hilly opened CBGB to cater to the NYC Country Blue Grass Blues crowd, however, Tom Verlain and the boys in Television convinced him to let them play as the house band; a nucleus of punk fans started to hang out there, and the rest is history. All mp3s hosted by zShare today, as DivShare is giving me more guff than usual. Apologies for the ads. Television's debut album Marquee Moon rocks. I can't really say I've extensively listened to the rest of their catalogue, but I could post the entire Moon album and not be ashamed. The title track is just huge, eleven minutes of punk masterpiece: Marquee Moon. I'm not exactly a huge Blondie fan, but I remember Grandmaster Flash talking about this song one time, saying essentially that even though no one knew what the hell Debbie Harry was talking about on this song, the hip hop community appreciated her efforts! You gotta hear this one: Blondie's Rapture. I've been dreading this. Choosing one or two Talking Heads songs is really difficult. And to hark back to my Fela Kuti post: Fela's Riff (Unfinished Groove) from Remain in Light bonus materials. Post title continuation: "this ain't no Mudd Club, no CBGB, I don't have time for that now." -David Byrne on "Life During Wartime"
I guess I blew off posting last night's dinner, so there's a two for the price of one policy tonight. Ingredients: Basmati rice, Spinach, Garbanzo beans, Brussels sprouts, Green Pepper; plus garlic, pine nuts, salt, yogurt cheese and hummus. Oh, and pita chips. Globe artichokes, Brussels sprouts, pumpkin seeds, pine nuts, Basmati rice, spinach, sun dried tomatoes. Three heating devices tonight. While the rice simmered in a small pot, two artichokes boiled in a large one. In the wok, olive oil, chopped garlic, pine nuts, and pumpkin seeds got comfortable with some salt, dried herbs, and cracked pepper. During the long prep time for the artichokes, the wok took on some boiled Brussels sprouts (using the artichoke water to save time and energy) and a large handful of spinach leaves. Rice on the bottom, with vegetable and nuts along with some fresh spinach leaves, topped with sun dried tomatoes, and served with a handful of pita chips (Simply Naked, with Sea Salt). Hummus on the side. For a nice digestif afterwards, we ate the artichoke leaves dipped in olive oil with significant amounts of garlic powder, sea salt, "all purpose seasoning", and pepper. They tasted strangely of beef jerky, as Leslie and I separately noted (I called it a 'peppered beefstick', perhaps to technical a term for a long-time vegetarian). Quite a nice delicacy to enjoy after the meal, which was also quite fabulous. I have to start with this little gem: this kid MISSES THE OCEAN. Seriously. DES MOINES, IA—Forty-five minutes after sitting down with a cup of coffee and the USA Today crossword, local window fashions salesman Tom Dolan completed the puzzle's last three open squares and was filled with a sense of intellectual accomplishment. Though he admitted to consulting the Internet for the tougher clues, such as "a Kentucky liquor aged in oak barrels," Dolan, 38, credited the successful completion to his amazing ability to follow word-based clues. "The clue said 'Charlie's' blank," Dolan said. "It took a little while, but I realized that it was 'Angels.' That was my Rosemary Stone for unlocking the rest of the puzzle." Dolan's confidence in his superior cerebral faculties faltered slightly after he noticed the adjacent Sudoku grid, but then he realized that it was rated "hard" and was immediately relieved of the pressure to solve it. And here in good old Phoenix the other day, a 22 year old fan painted Sedona red from the waist up was tossed from Chase Field for drunkenly swearing at other patrons, came back for some reason, and was arrested for trespassing. Still painted red. Tonight I was planning to have twice baked potatoes featuring artichoke hearts. Unfortunately I got a later start than I wanted to have enough time to boil the artichokes, and then the skins on the red potatoes were too fragile for me to scoop out the mash. So we have skin-on-skin smashed potatoes, mixed with black beans and basil leaf, and given consistency and color with yogurt cheese. For the bed of greens, I fried garlic and pine nuts with a little salt and minimal oil until they started to brown, and then sauteed whole organic green beans and quartered Brussels sprouts, with a little basil leaf for consistency. At various intervals I added a touch of seasoned salt here, a dash of cracked peppercorn, and occasionally splashed the wok with a handful of water to get a "steaming" effect going on. For color and because they're so damn good, a bit of a cherry tomato medley for the serving. I'm going to start with the last one: Did anyone else see the Yankees get beat by 16 last night! Hahahaha... nice start Moose. Art de Vany is quite a likable character: he writes with immeasurable wisdom on the science of food, he's an active 70-year old who loves sports - both performing and watching professionals, and he's an economist. He seems like a very even-headed and intelligent guy who's also fun: basically, who I hope to be in 50 years. Check out some of his writing here. A new paper purports to give evidence that women are better at orienting themselves to healthier food sources, for evolutionary purposes. Men were hunters, women gatherers; thus, while men are generally better at navigation (required to get home after tracking an animal longer distances), when asked post-hoc to locate a particular food source, women more precise. Less convincing to me is their argument for the female predilection towards pink-red hues rather than blue-green. This article is worth reading for the summed up findings. Is everything we know about saving the environment wrong? That's the title of an article in The New Republic ($1.25 an issue is probably worth it, assuming you're employed). I suppose I could be considered both a believer in "green" issues, as well as a skeptic; this article should give a good indication of why I'm not willing to radically put myself out for the purpose of not harming the environment: there's a good chance that I'm doing something else that harms something else. Economists are familiar with this problem. After kicking this one around for a while, we finally up and made a pizza. Homemade pesto: Parmesan, oil, basil, garlic, pine nuts. Meanwhile, the globe artichokes were boiling in the pot in the background - lid off so as to allow certain acids to boil off, otherwise the artichokes turn brown. Leslie learned me how to prepare the soft, boiled artichoke, by clipping the talons and saving the lighter green leaves after stripping them off to the heart. We used the chopped hearts of two artichokes to top off the pizza, and baked it for around 20 minutes on 350. It was delicious; although like I said, the Brussels sprouts could have used some treatment as they were fairly bland. I also forgot to put any oil on the pan before we started, so there was a little cleanup on the slatted cookie sheet. But it was a good learning experience, and we have two more artichokes to have fun with; by the way, we ate the boiled artichokes' leaves with an oil, garlic powder, dried basil, and sea salt mixture, scraping the soft parts with our teeth. I didn't know about that little bonus of artichoke prep either. The great thing about Mediterranean pizza is the versatility. We could have used a marinara dipping sauce at any point; obviously kalamata olives and feta cheese usually come to mind, as well as any number of fish products; radish, capers, vinegar, eggplant; practically any vegetable would have been just fine with this one. In the future, I think we'll probably make a big batch of pizza dough and freeze it, but for $1.50, the whole wheat dough from T. Joe's is really good: if all you're putting on it is vegetables, it's a pretty cheap dinner for two. 1. The Minimalist. New York Times column rattles off 101 meals that take ten minutes or less. Lots of fresh seafood here. 2. Joe Sixpack on Philly.com: The Pub As Urban Tonic. 3. Flying Dog Brewery has set up a website for beer pairings. F.D.-centric so far, hopefully they expand their repertoire a bit. The "Fill in the Blank" of "Who Knows Where"
Today we're going to start incredulously staring at a series of artists that have come to exemplify a particular style of music native to their country. The prototype here is Bob Marley, ambassador of reggae music and Jamaican generally. I'll probably be posting much more of my old reggae (ska, calypso, soca, etc. ), but the number of "Bob Marley" fans to "roots reggae" fans is a little ridiculous. The Stare is tipping a glass to all time greats, at infrequent time periods. To start, I think the most apt comparison to Marley is Fela Anikulapo [Ransome] Kuti. While Marley had nothing to do with reggae's origins, however, Fela virtually invented the genre with his band. The two biggest names in traditional Nigerian Afro-Beat are his son Femi Kuti and his former drummer Tony Allen. He was a towering giant in the political and musical history of Nigeria, and Africa in general, and I'd like to share some of his music, and that which recalls his legacy. Furthermore, he was decidedly outspoken politically, decrying the corruption and crime, violence and insensitivity, and racism of African governance, not the least problematic of which was Nigeria's president Abiola and General Obasanjo. A strong believer in Pan-Africanism, Kuti at various times embraced socialism, the Black Panther movement, and his own brands of political ideology: in the '70s he established a communal home/recording studio for many connected to the band known as the Kalakuta Republic. Although he declared it outside of Nigeria's law, the authorities disagreed. The Republic was also formed in part as a polygamist colony; at one time Kuti had 27 wives. Fela died in 1997 of complications related to AIDS. His legacy lives on in his son Femi, who records and tours in the Afro-Beat style today. He is as politically outspoken as his father, while also opening his music to a wider array of collaborators from the West. Here's Traitors of Africa, and here's Mos Def on Do Your Best; both off of Fight to Win. Tony Allen drummed with Fela for most of his career, and he's still making vital music. 2005's Lagos No Shaking was outstanding, and he's just released a new album. Here's Morose from Lagos, and Crazy Afrobeat from Home Cooking, 2007. Finally, the Red, Hot series caught up to Fela with the "+ Riot" edition, here's Water No Get Enemy by Femi Kuti with D'Angelo, Macy Gray, and Ahmir '?uestlove' Thompson. And Red, Hot & Riot info here. First of all, congratulations to my sister Carlye for creating a meal to be proud of..it wasn't so long ago that she didn't know a skillet by name. She sent me this picture last night after commenting on several of the blogged meals. Stir fry veggies with rice, spinach and bean salad, some gorgeous-looking grapes, and a few slices of cheese. Brilliant! Very attractive and it looks delicious. Our meals have been less than blog-worthy lately: last night we had mostly reused ingredients from already posted meals (that turned out more than fine: rice and beans with decently fresh vegetables is obviously a modus operandi around here). Tonight, with a "Buy One Get One Free" coupon in hand we marched into the local Papa John's and ordered a 'Market Fresh' pizza and got a free half-banana pepper half fresh-tomato large free. Tomorrow's looking like leftover eggplant, maybe with some pasta, and there's going to be a lot of 'za left. Look for a special treat sometime shortly thereafter. Speaking of new, Isaac, er, Eric Asimov of the New York Times wine column The Pour, covered Belgian pale ales yesterday. He seemed to think that this is some kind of unknown style (Beeradvocate.com lists 585 style examples), some of the beers he mentions are in fact Belgian IPAs, and the beer the panel decided was the "best value" is - how to put this? - not tasty. But nevertheless it was an interesting article about spritzy drinkable summer ales, and most of the suggestions, including the top choice, Brasserie des Rocs Blonde, are quite good. Check out The Pour's take on Belgian pales. Thus what we need is a way of conveying information to uninformed, unsophisticated voters in a way that is entertaining yet produces information about politicians that is correlated with real skills. I suggest a game show, So You Think You Can Be President? SYTYCBP would have at least three segments. Game Theory: Candidates compete in a game of Diplomacy. I would also include several ringers - say Robin Hanson, Bryan Caplan and Salma Hayek. Why these three? Robin is cold, calculating and merciless - make a logical mistake and he will make you pay. Bryan is crafty and experienced. And Salma? I couldn't refuse her anything but presidents should be made of stronger stuff so we need a test. I added the hyperlinks to Overcoming Bias, of which Hanson is a contributor, and econLog, which Caplan writes with Arnold Kling. Also, Kathy G. responds to the sexism by suggesting the use of George Clooney to interrogate Hillary. I wonder if he chose Hayek based on her last name...I assume she's no relation to a certain Friedrich. Is this so far "left" that it's impossible national policy? Maybe the "virtually" could be removed if the U.S. showed more responsibility as a global citizen. Perhaps not, but if our stepping down as "World Police" backfires, we can always go back to war-mongering. Leslie had a dream this weekend involving eggplant parmesan sandwiches featuring a habanero-marinara sauce (habanara). So when we were out shopping, we got an eggplant. Despite the fact that I knew nothing about eggplant preparation, I decided to make eggplant parmesan sandwiches today. I learned a lot on the Internets about eggplants today. I learned that they are too moisture-heavy, and should be dried considerably before consumption. I also found out that the best place to look for a good eggplant parmesan is a Philly steak house joint. I guess the theory is that if they are good Italian cooks, they're good Italian cooks..anyways, perhaps I'll test the theory some time and let y'all know. I warmed the oven a hair, and laid out some lengthwise-sliced eggplant for several hours. When I started actually preparing dinner, I began by slicing whole mushrooms and zucchini and laid them out over the long eggplants. I heated those for 'a while' in the oven at 300 degrees. For the marinara sauce, I took a small can of tomato paste and heated it with garlic and olive oil, added one chopped Roma tomato, some chopped green peppers, and the detritus from the mushroom chopping earlier, simmering them for a good bit with onion and garlic powder. When it came time to serve, I reheated the sauce, added some basil, spinach, and mixed greens along with some dried herbs. For the 'sandwich' part, I sliced as thinly as I could a loaf of rosemary olive oil bread and laid out grated parmesan cheese. The eggplant sandwiches were served with a spinach salad. It was a good, if flimsy, sandwich. I was happy with my first time cooking with eggplant. I didn't make any more sandwiches, but for seconds we ate the vegetables topped with sauce, and just pulled chunks of bread. I wish we had a bread slicer..
Monday night dinner was an all-Leslie affair. Red peppers wokked in garlic and chopped onion with some basil and squeezed lemon juice, with salted basmati rice mixed in. Served over a bed of salad greens and spinach, topped with pine nuts, and with sliced zucchini on the side. I, Cringely blog author Robert Cringely writes that staying alive until the Singularity will be the hardest part. It's a nice overview of an event that polarizes really intelligent people, from Ray Kurzweil (optimist) to Bill Joy (inventor of the Internet and pessimist). For those not hep to meta-technology geeks, the event known as the Singularity occurs when a technology passes the Turing Test, and is smarter than the human with which it is interacting. "the Singularity is a phenomenon with both technological and economic components. Moore's Law works the same way. The underlying concept of both is the level of technological development we can reach AT A CERTAIN PRICE. The most powerful supercomputers can cost tens of millions of dollars and it is logical to assume that something on the order of a supercomputer would be the first machine to reach Singularity status. That's fine and would undoubtedly result in the creation of knowledge that would have an impact on all of us simply through the existence of that knowledge and its subsequent use by people and machines who may not have yet grown to Singularity, but what will really change everything is when the price of Singularity drops low enough to apply to the computer on our desks or on our wrists." I'm attempting to build a crossword puzzle. It's going very poorly. It's not that I didn't know that it would be tough, but I may have underestimated how difficult it is to just do. But if I ever get it going, I'll post it here. I was hardly inspired by today's snoozer. Seven minutes, including one full minute of the Across Lite app being hung, and another minute where I was just talking to the leasing manager at the complex. The theme was trios: Three Men in a Tub, Three French Hens, Billy Goats Gruff, etc. I learned nothing and liked only a couple of answers: Lake TITICACA, MALARKEY, ROCS, RESPITES. I'm also no closer to making my own. At approximately the age of seven (he doesn't know his exact date of birth) Emmanuel Jal was pressed into service with the Sudan People's Liberation Army. He fought with them for several years before leaving to join a rival rebel group closer to his home in the Upper Nile region. There he met and was eventually adopted by British aid worker Emma McCune, who smuggled him into Kenya with her. McCune died shortly thereafter, and Jal eventually returned to school, studying in both London and Kenya. A religious conversion led him to take up music as his vocation, and he now serves as the spokesman for the Campaign to Stop the Use of Child Soldiers. On this album he is joined by singer, composer, and oud player Abdel Gadir Salim, a venerated master of northern Sudanese music and a prominent figure on the other side of the Christian/Muslim divide that has contributed in large part to the civil strife in Sudan. Their collaboration is symbolically moving, but is also musically fascinating; Salim's songs are steeped in both the urban and folk music of his region, whereas Jal is a rapper with roots in American and British hip-hop. I didn't get a picture, but we ate it picnic-style on a blanket on the floor. With our laptops. How modern..
"Our Lives, Controlled From Some Guy's Couch". Nick Tierney op ed about a theorist considering the possibilities that our world is actually an "ancestry simulation" a computer program being run by higher intelligences. Matrix-like, and interesting, if a bit out there. "How To Save Money On Gas". Fairly self-explanatory. These are done with chalk, by the way. Incredible discovery today, one that may cause others to look strangely at me: I can talk to my computer and make it do things. The real joy is in Finder, which has a list of probably 20 speakable commands programmed in. The best command is "Make Speakable" which takes that window and makes it, well, speakable. For instance, one of my most used folders, the only one on my desktop in fact, I call "Inbox". All my downloads go there, so every so often I visit the inbox and sort through it. It keeps the desktop clear (each icon on the desktop is treated as an open file, taking up RAM), and it's easy sorting in the finder: mp3s go here, crosswords here, pictures here, open disk images to try out new apps, etc. So my new way of getting to the inbox is: Hold 'Escape', say "Inbox". That's it! Safari bookmarks are also speech-ready. With any open page, hold escape and say "Make Speakable". A little dialog box opens where you can call the bookmark something simple, like "Gmail" or whatever. Then just hold Escape and say the name of the bookmark, and it opens in a new tab in the open window. I probably won't use this much in public for two reasons: I can't imagine that it recognizes speech very well with background noise, and you'll look a little strange talking to your computer. In honor of this geekery, here's Home Computer is More Fun to Compute by Kraftwerk. Milky Way is a program that replaces Preview on OS X. When I want to look at a picture in Finder, I click on it and M.W. pops up a slightly larger image. If I want to see it full scale, just click on the pop up and it opens full screen. No opening of programs, no need to "Quit" Preview. Meteorologist is a nice little app that displays an image of the current weather, along with the temperature. Fairly customizable, and very stable. Tiger Launch is an application launcher. Clicking on the paw opens up a customizable list of applications. I only keep ten things in the Dock, including Finder, System Preferences, and Namely (which I will discuss some other day) - none of which go away anyhow. The remaining Dock apps are "frequently used" in some sense. The envelope is a Google Notifier for Gmail, the number next to it is how many unopened messages are in my inbox. Also, when I get a new email, a Growl notification pops up, identifying the sender, the re: line, and about eight words into the first sentence. Which is nice. The scissors is a sweet app called JumpCut, which holds *everything* that goes to the clipboard. Anytime "Copy" is invoked or Command-C is held, that text goes to JumpCut; from the menu bar I call pull down the last ten, or with a key command I can toggle through the last fifty (!) copies. Which is really nice for when you want to copy several things without switching tabs, windows, programs, whatever. The small numbers on top of each other are Top: internal temperature of my Mac and Bottom: fan speed, in RPM. I stick with Apple defaults for the most part, but if it's getting really hot I'll turn up the minimum fan speed to more quickly cool down the laptop. Things like playing movies or music with full Internet-browsing can run up the temp pretty fast. MainMenu is a "system optimizer" with a couple of nice features. It makes some "command line" stuff a lot easier: things like running maintenance and chron scripts, repairs, cleaning, and some other tasks. My most used features are probably Restart Dock, and enabling/disabling Dashboard (another memory hog). The rest are Apple prefs: Battery, showing the graphic and how much time til the battery runs out, AirPort show the wireless signal, Microphone for audio volume, and my customized Date and Time bar. This one was tough to figure out, but you can pretty much make that say anything up there. I abbreviate the day to save space, but I like to have the whole month there, along with AM/PM. Not that I don't usually know, it's just nice. The profile is "Fast User Switching", a nice little feature that lets me log into another account very quickly, by choosing the account from the drop down menu, then typing the password. Bypasses the Login Window entirely. Which brings us to Spotlight, the much-maligned and actually doomed feature that searches your harddrive for keywords. I don't hate Spotlight, but I only use it occasionally. If I upgrade to Leopard in October, though, it's gone. I still managed to get through a reasonable amount of literature, between class assignments and textbooks, books I would grab along with my textbooks from the book store, checkouts from the public or school library. It's always haphazard, but it's something. And now there's a new something, something that appeals deeply to my Internet-indebted soul. It's called Daily Lit, and the premise is that you can receive snippets of literary works on the daily. There are two options: a feed reader, or email. Either way is easy enough; I use Google Reader and get an updated chapter/poem/lengthy paragraph every day at 3 am. The other way to do it is have an email sent at a designated time. It's still a bit haphazard, as the works they have available are a somewhat short list, when compared to, say, the downtown Phoenix library. But the price and convenience can't be beaten. Two key features: you can read as many works as you like, and you can refresh feeds as often as you finish them. The former refers to the fact that Daily Lit has reference works, foreign language novels, and poetry in addition to English language non-fiction and novels. These days, I receive a poem from William Blake, a random quotation from a work called "Many Thoughts of Many Minds", and a chapter or two of Tristram Shandy, Gentleman each day. The latter feature means that as soon as I read the sentence or two that is a random quote, I can click a link to send the next quote to my reader. Whether you just want to re-read Jonathan Swift's "Modest Proposal" in four installments, or care to spend two years slogging through "War and Peace" or "Les Mis", Daily Lit is probably worth your time if you check your email every day or if you already are invested enough in the Internet to use a feed reader. You won't notice a radical change between last night's dinner and the one before. Over a base of cous cous, we've got garbanzo beans, basil leaves, sliced zucchini, peeled tomatoes, and the other half of the orange pepper. Served with a handful of cherry tomatoes and yogurt cheese. In a new twist on vegetarian cooking, tonight dinner was based on...rice and beans! After two false starts (not hot enough, oh wait, wrong burner), basmati rice finally started to boil. In the wok, chopped garlic and oil heated up a good handful of cilantro, and quite a bit of leafy basil. Sliced zucchini followed shortly thereafter, and rounded out the "green" lineup, and a half can of kidney beans also was added. The "red" team was comprised of one carrot, chopped, and a half of an orange pepper. I added a scoop of red pepper/artichoke tapenade (visible in the center of the bowl), as well as some feta crumbles and a dollop of yogurt cheese to serve. Nothing exciting, but tasty and filling. By the by, Trader Joe's yogurt cheese doesn't get a lot of love from google, but you can see from various message board posts (especially the Chowhound one, I read the site and like it) that it is at least somewhat popular. I'm totally enamored: it can replace milk, cream, cheese, cream cheese, plain yogurt, and sour cream in a recipe. And half and half, or whatever other dairy product you wish. It's amazing. And it's just fine to spread on crackers or a chunk of bread. I'm not sure what it "is" exactly, it's yogurt but doesn't share that consistency, and they call it cheese but it's not that consistency either. It's most like whipped cream or maybe margerine in that it holds its shape but also spreads easily, but it's not light and fluffy or particularly smooth. It's just wonderful. To start: Divshare was annoying yesterday, so I held off posting a birthday song for Mom. Here's Smokey Robinson with My Soul Responding, which opens with a dreamy rendition of Happy Birthday. Some very interesting news stories today. Nobel laureate Joe Stiglitz takes on His Ex-Holiness Alan Greenspan in the Shanghai Daily. For more on tax cuts and the sub-prime, click here. I'm a resident at one of the Harvard hospitals. In the past couple of years I've had the chance to attend a number of inter-disciplinary seminars where you have statisticians, physicians, sociologists, anthropologists, epidemiologists and economists present. I've been impressed with what your discipline has to say: in virtually every seminar the economists are able to say something useful. Without inflating your ego, I've also noticed that the economists present better papers and are less likely to be caught off-guard in a seminar. They are also more likely to discover problems in the work of others. I've been trying to educate myself on the economic way of thinking by reading your blog, Freakonomics, and now, by slowly reading your textbook. For the rest of the question, asking why economists are so aggressive, etc. go to Dr. Mankiw's blog here. Harvard's Political Economy chair Dani Rodrik looks at why economists disagree so often. His response is that most disagreements break down at a fundamental level: how the economist feels about The Fundamental Theorum of Welfare Economics. For Dr. Rodrik's discussion of "first-best" and "second-best" economists, look here. And in the crossword today, I got stumped late by a Tuesday. Boo. * 55A: NOODLEHEAD - Noodlehead?? It took me ten minutes, plus a minute or so for a typo, which turned out to be just a mistake. I was unfamiliar with ARETES, and not quite getting Chicken TENDERS. A major part of the problem was that I had ETA instead of "Airline stat" ETD. So arbitrary. Also, Hebrew months are cheap. Oh, I forgot the most annoying part. After six theme "doofus" answers, 63D, the final clue, says "Not a doofus". And the answer is "YOU". Please. Check out this interesting site which tracks, well, lots of things. I found the number of internet user rather astonishing. Check out rates of change here. Read Even Public School Employees Love Education Tax Credits over at Cato At Liberty. Ok, this is more than a little freaky: the new head of public education for the state of Texas is a nut-job creationist. Read more about this man who WILL push church and state together. Billy G. should just be happy that Apple didn't rub it in and use a Bluetooth keyboard and mouse in the photo, reducing the number of wires to...one. First things first: Happy Birthday Mom!! In sports news, Hank Aaron proves that it's very important to Listen Closely. Apparently in his JumboTron speech after Bonds' 756th, he pokes a deliberate yet subtle jab at the new record (and by extension it's holder). Check out more here. Art de Vany reviews Bonds vs. Aaron vs... well, everyone else. Here. Lots of math, but sort of interesting. Cousin Jay's Scotland pictures up. Not particularly impressed with any of the clues. A typo: the Montgomery Clift film theme (Daily Papers: Star, Sun, Times, Post) answer should be A Place In The Sun. My mistake. One clue that interested me was the Latin for "and all others". I've always seen it spelled "et alia" but this puzzle's answer is "et alii". I guess I should look into that. Also, my dad summited Long's Peak in Colorado, near Estes Park, which was a crossword answer. Here's Pops on top. Also, here's a link to some fuzzy economics by Democratic presidential candidates. I have some issues with the parser's critiques in some cases (like 30 million American jobs since NAFTA: many trade economists would argue that more would have been created without, etc.) but anyways, he's not on the ballot to run the country. Finally, Undercover Economist Tim Harford reviews Marginal Revolution hero Tyler Cowen's new book. Check it out at the Financial Times. I think I promised new Common in the header. So here goes "Play Your Cards Right" off the new album Finding Forever. After a long afternoon at the goodwill, dinner was a quick-make affair: whole wheat penne pasta, with sauteed spinach, and tapenade. While the pasta was boiling, the spinach went for a wok with some fresh basil, snap peas, garlic, and some cherry tomatoes. When the two were combined in the bowl, store-bought tapenade was added to complete dinner. Hilarious Fake Steve Jobs post about Linux devotees (those would be the Freetards) vs. Microsoft apologists over recent news that MS now has more Chinese market share. I saw one blogger call it "inspired". Peep over at the new Fortune.com-hosted FSJ. blogspot.com. Today I needed something quick - and a to-go order: Parent's night at Griffith Elementary School. With half a loaf of garlic bread, a tomato, and some quartered artichoke hearts, I decided to give a little Mediterranean twist to bruschetta. First I sliced the loaf lengthwise, then I canoed each half. Into each boat, I poured oil, garlic powder, salt, and some seasoning. Once the spinach began to wither, I spread it over the top of the long piece of bread I cut from the halved loaf. See? Meanwhile, I used a food processor to chop up some artichoke hearts, and a cut up tomato. This paste I spread into the bread bowl, grated some sharp cheddar over it, and put it in the oven to melt the cheese and lightly toast the bread, as seen here. When both portions were ready, I put the herb spread upside down on top of the wider artichoke-tomato loaf. Boom. Bruschetta sandwich.. So Leslie's turned out to have retained too much oil from the spinach and wasn't that great; but my half was really tasty. I'll have to try again, with fresher bread, and maybe remember to put the feta cheese on at the end. So I've officially moved from the land where palm trees sway, to the land where palm trees are fakes. Okay, well not native anyways. Here's a link to my Picasa gallery, the Hawai'i photos are unorganized, and there's more, but I'm obviously not moving too fast on it. In fact, I'm off to "the clubhouse" now, for complimentary coffee, cappuccino, and cookies, and a quiet place where I can do my crosswords. Perhaps later a photo of the apartment - we're in the market for a bookcase first, though. And just so this post can have a tag: apropos to a discussion Leslie and I had not long ago about Phoenix versus Des Moines tap water, here's Dave Matthews Band with Don't Drink the Water. I'm kidding, I drink the tap water here. Here's the rundown on dinner tonight: Totally inauthentic tortilla soup. Minus the tortillas, and hardly a soup. Hmm.. In other news, the new cheese grater that Leslie got from her grandmother got used for the first time! First I started out with the stock portion, only instead of using stock I used diluted sodium liquid from a can of garbanzo beans. Into the salty water went the beans to start simmering with a little garlic and a couple spoonsful of capers. Then I quartered a lemon, with half the squeezed juice into the wok, and half into the pot. Then I cut out the remaining pulp, half again into the pot, while the other half went into the food processor. Then I zested the lemon and once more split the proceeds between pot and processor. I dumped in some red pepper and a pinch of sea salt, capped the pot and set on LO, and left that for a long time. While I began to very slowly heat mushrooms with some garlic in oil, I used the food processor to chop up a fair amount of green onions, a handful of cilantro, more chopped garlic, and the lemon zest. Not too fine, you could still pick out which green was which, but it sort of chunked it all together at least. I poured most of it into the wok, the rest I dislodged from the sides and bottom with some water, lightly strained it, and added it to the "stock". The final touches were ready for the wok: about half a sliced red pepper cut lengthwise got tossed in with a sliced avocado, and I put a dome of de-stemmed spinach on to trap the low heat. Then I went swimming. I'll leave the visual of the mixture to your imagination; served with tortilla chips and some feta cheese. The New York Times reports today that high schoolers did reasonably well on a government-mandated economics exam. "If the wages for babysitting go up, how will teenagers respond?" The desired, and graded "correct", answer was that teenagers would spend more time babysitting and less time on other activities, all else equal. Two points to raise about this: one is the Income Effect. If teenagers feel that they need, for example, $50 a week spending money, won't they cut back on the number of hours spent babysitting once they've reached $50? That is, where it used to take 10 hours at $5/hour, now it takes 5 hours at $10 per. My guess is that most would spend seven or eight hours (if they had a choice, obviously): they make more money than their requirement, and spend less time doing a "chore". The second factor to consider would be that more parents might take their time off the market; that is, if wages rise enough such that parents would rather rent a movie and watch their own child, the hours available for teenagers to babysit will be reduced. And that's how an equilibrium is reached, kiddies. Seriously, I think this shows how difficult it is to teach and learn even basic economics. You might try to show your point with what you consider a banal example, but counterexamples abound even in the simplest of real world situations. Crossword madness this morning, as I started I think 5 puzzles. Today's Times was irritating me so I took a break to work on one of the supplemental August "bonus" puzzles. The theme was Dog Days, perfect for a hot Phoenix morning. I loved the Nathan's Hot Dog Eating Contest questions, interestingly both this puzzle and today's Times has gentleman named Chestnut[t] as clues: Contest winner Joey here, and songwriter Vic in the Wednesday. I began work on a diagram-less puzzle this morning, in addition to one written by Lee Iacocca. If I finish them, I'll post 'em. Dr. Gregory Clark of the University of Cal.-Davis has an intriguing-looking new book coming out, called "A Farewell to Alms", which analyzes the means by which mankind managed to escape continual poverty and jump-start the Industrial Revolution. Econ bloggers have been all over this one, preemptively debating some of the more provocative points. In his thesis, Dr. Clark describes the Malthusian trap, whereby a geometric marginal productivity increase through technology ushered in exponential population growth. He believes that throughout history, man has struggled on the cusp of this line: untenably rapid population growth when compared to cultivation methodologies, and that only through natural disasters (e.g., the Black Plague - caused by these very same factors of "too many people, not enough [fill in basic need]") was the number of humans reduced enough such that subsequent generations, inheriting the technological know-how, were able to provide for themselves. Of course, these evolutionary winners celebrated by copulating prodigiously, falling back into the same trap as before. Of course, in a rural agrarian society, children double as labor. So it made infinitely more sense to pop out as many kids as you could afford to feed for, say, ten years, at which point their labor productivity outstrips their consumption. But what causes a modern family - especially an urban, economically disadvantaged family - to continue to procreate so rapidly? Cost of contraception vs. Cost of raising a child? Hmm.. Speaking of rural-agrarian societies, Timbuktu has long been associated with "the middle of nowhere". It's just one of those proper nouns - like Walla Walla, Washington - that rolls off the tongue so nicely that you don't even realize where it is, anything about it, or whether it really exists. Apparently at one time, this Malian city in the middle of the Sahara was a bustling academic center, featuring the University of Sankore which boasted 25,000 scholars. Due to a confluence of agricultural and religious factors, traffic - and scholarship - declined in the late middle ages. Today the Libyan government is pouring money back into Timbuktu, with the intention of transforming it into "the Alexandria of Black Africa" by collecting ancient manuscripts in storage throughout the streets and nomad camps of Mali. I'll use this opportunity to post some traditional, and not so traditional, music of Mali - a nation of nomads for hundreds of years. Tribal songsmith, known as a griots (jeli, in Manding), served as a mouthpiece for the past and present of the Tuareg people. Carrying on this tradition today include great artists like Toumani Diabate, the recently deceased Ali Farka Toure, and Tinariwen, the latter riding a wave of international popularity today. While rooted in Saharan Africa, many of these artists have collaborated with Western artists and musicologists such as Mickey Hart of the Grateful Dead, Taj Mahal, and Ry Cooder. Born to royal lineage, with ancestral roots going back to Soundjata Keita, the founder of the Malian Empire in 1240, Keita was disowned by his father after announcing his plans to play music. Here's Yamoke, off his album Moffou. Also, have you seen the new iMacs? *Update: I forgot a song I wanted to post, that refers to the capital of Mali, Bamako. Amadou and Mariam met at an Institute for the Blind in Bamako in the '80s. Both blind, they have three kids and have toured together for the last 20 years. And, besides, the premise is completely false: If you trade in the Expedition for a Honda Civic, that oil you save won't stay in the ground and thus impoverish the Saudis; it will merely be sold to the Chinese and Indians and other fast developing nations who will replace America and Europe as buyers of the cheapest and most easily extractable oil in the world. So the sheikhs will be as rich as ever and funding as many Islamist nutters. But we'll be driving worse cars and feeling virtuous. Dude has not quite put Economics and 101 together. I'll leave aside the value judgement of which is a 'worse' car, not to mention the environmental benefits/morality of reducing your carbon footprint, reducing emissions, yada. If we don't buy oil, that's called a reduction in demand. When demand falls, prices fall. When prices fall, revenues fall. If revenues fall, then by definition sheikhs will NOT be as rich as ever. Of course the oil won't stay in the ground, the Saudis are paying to remove it. They are unlikely to reduce their investment in oil production anytime soon, so every marginal consumer that doesn't pay them for their efforts hits their financial bottom line. Furthermore, Sino-Indian demand is going to rise, regardless of U.S. national policy and its citizens behavior. So either the Saudis get the COMBINED force of a rise in Asian and Western demand, or they get a rise in ONLY Asian demand. If demand goes up a little, prices (and revenues) go up a little. If demand goes up a lot, and American companies are brawling in the market with Indian speculators and Chinese industry, the Saudis benefit by very high prices, and an overall increase in net gains. My point's bottom line: a reduction in U.S. consumption leaves the price and revenues lower than they would have been. Leaving the Saudis with less money, to fund fewer Islamist nutters. So, yeah, I will feel virtuous as I ride my bike and drive my small car. I can't affect Chinese trade policy, or the driving habits of the emergent Indian middle class, so I'll do the only thing that is in my power: give as little of my money to the Saudis as possible. First I had minced garlic boiling along with the potato medley. When those were done, I added a bit more sea salt, mixed in a bit of shredded cilantro and spinach, and topped with sliced green onions and yogurt cheese. That was piled into half a dish. While I was doing that, Leslie was working on the wok. One can of black beans, one can of kernel corn, a chopped tomato and half of a chopped yellow pepper were the main ingredients. Over medium heat, cilantro, green onion, and spinach were added, along with a good dose of crushed red pepper. I poured vegetables into the other half of the bowl until full, and topped with a sprinkling of nuts. Then a cantaloupe was quartered, half of which was served. Fin. By show of hands, who here uses P2P programs to acquire music, video, etc.? Btw, I use Transmission as my downloading client, I've heard good things about xTorrent as well. Also, in new music news today, we've got..
and a James Brown 'Singles' comp drops. Also, Zap Mama has a new album "Supermoon" out; Marie Daulne is probably my favorite Belgian-Zairean soul chanteuse. Featuring songs in French, English, and "pygmy onomatopoeic vocal techniques", Zap Mama deliciously blends African soul with European and urban production. I point you to Yaku, off of 2004's 'Ancestry in Progress', and recommend that you turn up the bass. Finally, the Flight of the Conchords have an album out. I think they're funny, plus, the sidekick's name is 'Bret', just like that. I don't have a TV, so I don't know if their show on HBO is a flop or not - maybe one of these days I'll grab a Torrent..
**Huge update: Lifehacker has posted up a carnival of BitTorrent goodness. Check yo' self before you wreck yo' self: here." Tuesday Crosswords, More Music, and a ? Tuesday's NY Sun was awesome: the theme was related to King Arthur, and as you can see from the photo, the grid was arranged so that the black spaces show 'the sword in the stone'. Merlin, Arthur, Pendragon, and Excalibur are all theme answers. It was actually tough for me to finish, taking about 12 minutes. I also had some trouble with the Times, although 11 minutes is about par for my Tuesday course. 'Sopranos' theme today, although I thought the theme answers were a bit ham-handed: 'Fuhgedaboutit' is really tough to spell; 'You talkin' to me?' is from "Taxi Driver"; and 'Mob Scene' is kind of a poor play on words. Bit of trouble with the NE; I thought the Army barber clue would be Crew Cut, not 'Buzz Cut', which made EZ Pass nearly impossible, blah blah. Whoops. Also, huge rookie mistake in the Casablanca reference: Rick's love is 'Ilsa', not Elsa. Dammit. Well, I was determined to make these crossword entries more fun by including thematic music. Since "1975 Pink Floyd album" was really easy for me but I don't have my CD with me in Phoenix, here's a cut off "Meddle" that I really enjoy: One Of These Days. The title comes from the growled lyric before the song takes off; "One of these days, I'm going to cut you into little pieces." Yikes. Finally, does anyone else do these things? I haven't really found any other free daily puzzles that are worth my time. The L.A. Times website offers the last 30 days free, so I'm going to look into that, but the Chicago Trib and all the D.C. papers gate their puzzles. If anyone tells me about a good free puzzle, or hooks me up with a password, I'd be happy to share my NYT username and pw. You'd have access to 100 free archived articles, all the TimesSelect content including columnists and gated blogs, etc., along with ALL past and present crosswords. Comments are open. In which I fisk a beer review. One of my most visited websites is Beer Advocate. It's just that: advocacy for beer, an oft-maligned beverage. The primary function of the website is reviews, primarily of beers, but also beer bars, breweries, etc. In this Incredulous Stare, I'm going to Zapruder a recent review I wrote, of an American IPA by Alesmith Brewing in San Diego. I gave Alesmith good grades: it's near the top of my ratings list on the site, and quite possibly the highest ranked India Pale Ale. And speaking of India, here's new 'ish from spaced-out producer Madlib's latest addition to the Beat Konducta series: Masala. First pour is slightly cloudy from the pint plus six bottle, haze increases as the bottle is finished. Amber color that thins a bit towards the bottom, while a host of rushing bubbles make their way to the two finger full off white head. The first quality the review is meant to judge is Appearance: take note of the color; relative clarity, i.e., is there sediment or haze in the glass; and the characteristics of the head - color, height, quality of bubbles (small and foamy, large and soapy), how long the head stays intact, how much lace sticks to the glass during the drinking process. Etc. The Alesmith IPA is bottle-conditioned, meaning that after the brewing process is completed and the beer is packaged, additional yeast is added to the bottle, keg, or cask. This produces additional complexities of sugars and ester alcohols in the flavor. It also results in a slightly hazy appearance, as the yeast sediment will settle to the bottom during storage but often is shaken loose during transport. There is nothing wrong with this; in fact, bottle-conditioning is generally considered a good property for many styles of ale, and thus the sediment is welcomed. American IPAs generally range from clear, pale orange to an opaque brown-amber that may show some orange highlighting. This one falls slightly darker on the spectrum. I didn't mention it, although my guess is that the head had good lasting power and stuck quite a bit to the glass, as higher-hopped beers generally have stickier, retentive properties that results from the resinous hop flower additions. The magnificent look is matched by the powerful and flavorful nose, nothing new for a San Diego IPA but very well done: piney, floral, and citric hops out-muscling slightly sweet caramel malts. The flavor is every bit the progeny of this awesome aroma, as the rich sweet malt provides a sturdy backbone but comes nowhere close to touching the citric vibrant and pine-bitter hopping. There is a certain amount of fruitiness derived from esters in the yeast, but also some citric zest from the hopping. The next characteristic is Aroma: what does the beer smell like, and how powerful is that smell. Even more subjectively, Is it good? I've lumped the third ranking, Flavor, into this paragraph as well. I'll get into "flavor" characteristics over which beer can range some other time, but the important things to emphasize in a review are 1. How does the malt profile add to the nose/taste?, 2. How do the hops impact them?, 3. Do the chemical processes of sugar to alcohol conversion affect things? (That is, does it smell/taste of yeast, like bread, or of alcohol? This is generally a 'peppery' scent.) Finally, are there specialty ingredients involved? These can range from wheat, rye, rice (or worse) additions to the malt bill, to fruits or vegetables, to herbs and spices. Hop aromas and flavors are well categorized, as beer drinkers that love a huge hop profile (hopheads) often get a touch effusive when describing the flavors imparted by the leaf. Like grapes in wine, hops are region-sensitive, and since they are cultivated by species, they will impart trademark flavors that are often associated with a particular style - or even substyle. This is why Jim Koch of Sam Adams calls hops the "soul" of a beer. Examples of style-specific hops would include Saaz and other continental hops associated with Czech pilseners and German lagers; Fuggles and East Kent Goldings in Britain; and the "4 C's" hops used predominantly by Pacific Coast breweries. Further, IPAs can often be broken down by San Diego style vs. Pac Northwest style, with California breweries often dividing somewhere between LA and San Francisco. American brewers have rejuvenated the IPA style vigorously in the last several years, with a "more is better" strategy of adding hops - in the process creating the Imperial, or Double IPA style. The Pacific coast brewers often use high alpha oil, resinous hops that impart citric (grapefruit, orange/lemon zest), pine, and/or floral characteristics. Alesmith does all of this without losing a sense of balance: IPAs are often paired with caramel-sweet malts that offset the bitterness, while the ester alcohol byproduct of yeast fermentation tends to lend a fruity character to the flavor. Just so here. Medium to full in body, with a dry full finish of lingering bitterness. Alcohol makes its first appearance here, although it could be argued that the spicy bitterness betrays a higher alcohol content than many/most Am. IPAs. Either way, it lets you know you're drinking a powerhouse, an incredibly tasty IPA that, even if not quite 'balanced', steps right up to the line of a double IPA - maybe sticks a toe over - but remains very drinkable and delicious (and dangerous) not matter what the style. The last two measures of the review look at Mouthfeel and Drinkability. Mouthfeel refers to the relative thick- or thinness of the beer, ranging from full and creamy to thin and watery. I usually the characteristics of the finish here as well: does it leave an aftertaste, do additional flavors develop during the swallow, is it "dry" (used just as in wine)? Drinkability is a catch-all for anything that escaped the last three qualities, as well as a compendium of the three. Is it pleasant to smell, drink, and savor? Is the alcohol overbearing? Should something have been done differently with the recipe? The question is, Do you actively want another? Alesmith's IPA got uniformly solid marks for me. High hopping is going to thin the body out (grains are "tougher" and "chunkier" than green, flowering plants) necessarily, so I'm not looking for a really chewy mouthfeel here. This will also tend to leave a bitterness, and dry the finish out. I like all of this. To address drinkability, I note that this is a seriously hopped IPA, and indicate that it nears the bitterness of a Double IPA - don't take my high numbers to heart if you know you like a pale ale or lager. But if you really like double IPAs, look into this one. Another issue, something of a bone of contention among reviewers, is the challenge of reviewing to-style versus purely characteristic-based scoring. For instance, there may find a beer that is delightfully balanced, tasty and sessionable, but you don't think it fits the style characteristics that well. For instance, Breckenridge Brewing produces a small batch IPA called 471. The bottle, and BeerAdvocate, refer to it as a double IPA. It's not. It is "double-hopped", meaning that at two distinct points in the brewing process, additional hops are added. When I looked at the reviews, I thought it strange that everyone was blasting it for being so light, not bitter enough, etc. For an IPA, it's more than enough hopping, but to legitimately be called a double IPA there should be much more of everything: malt, hops, and alcohol content. So I reviewed it very favorably, and encouraged future reviewers to put aside thoughts of "Imperial India Pale Ale" and focus on the flavor points. I understand the point of reviewing to style, which encourages brewers to properly market their products - and I'll certainly note when I think a beer treads territory it ought to avoid - but when I sit down to judge a beer I'm going to do so considering the actual characteristics, not my ideal version of the style. A combination I'd been meaning to try for A Long Time (off the new Roots album Game Theory). Whole wheat gnocchi made with sweet potato. Oil- and sea salt-ed boiling water, gnocchi to the bottom of the pot. Two minutes later, they come popping to the surface all ready to go into the pesto bowl. With the gnocchi-water still warm, I dropped some kidney beans into the pot to heat. Perhaps not made like an Italian grandmother, but it turned out well enough. I started by finely chopping basil leaves, discarding the stems. I added some finely chopped garlic, drizzled olive oil and stirred. Then I hand-chopped some pine nuts, probably a mistake, added more oil, and stirred. It was too 'wet', so I added some dried basil leaves until the desired consistency was achieved, and rolled the hot gnocchi around in it. A spinach salad topped with a few sprigs of fresh cilantro, oil and vinegar dressing, topped with crumbled feta takes up about a third of the plate; the gnocchi and beans -also with the cheese - each have a little spot as well. Around the edge of the plate I also added a couple strawberries and some Mt. Rainier cherries that are absolutely delicious. Put this under the heading of: Things I Like, Especially Together. Monday crosswords = Easy. I finished the Times in under 9 minutes and the Sun in about 10:30. Not much to say about the Sun, most of the clues were fairly straightforward. The grid was in a 15x16 pattern today, which is unusual. The theme was "Look! Up In the Sky! ", a reference to the Bird..Plane..Superman; theme answers are The Painted Bird, Snakes on a Plane, and Man and Superman. Astute observers may notice that the grid isn't filled, I guess I didn't bother finishing Male Duck = Drake and Travel Mag Recommendation = B and B. Similarly quick work with the Times today, the theme was... oh, wait, there was no theme given. Seven answers point to the sport of bowling however. The only clue that stuck out in my mind was the answer Boatel for Seashore accommodations, which through me for a loop, especially when I put ASK instead of AOL for Yahoo! competitor. Also, I notice that I entered Octave in place of Octavo. Even though I didn't know what the heck an Octavo was, the On Notice cross made it an easy fill-in, I must have mistyped. So that's that. Sometimes I get a case of the Mondays just doing the boring crossword puzzles. But there's always the work of getting the time down.